Summer is here to stay for a while and the abundance of fresh vegetables is here as well. Tonight the only meal that sounded good was salad. Yes, but not your conventional salad, a salad with a twist.My mom just sent me from her beautiful garden some exquisite vine ripe tomatoes. She sent me and assortment of sized and shapes . The cute small cherry tomatoes have patiently been waiting for us to eat them since they have arrived.Freezer door open and I pulled out some wonderful shrimps from Pete at Personal Gourmet. We also have some avocados that are perfect to be enjoyed and our summer salad was created in a flash.Easy dinner with little time in the kitchen is perfect ending to a wonderful day. 1. Peel 1 large ripe avocado, remove the core and slice in ½ inch thick slices. 2. Heat a medium size cast iron skillet. 3. Add the fresh shrimps and sauté over high heat until they turn pink. 5. Cut the cherry tomatoes to smaller bite size. 6. 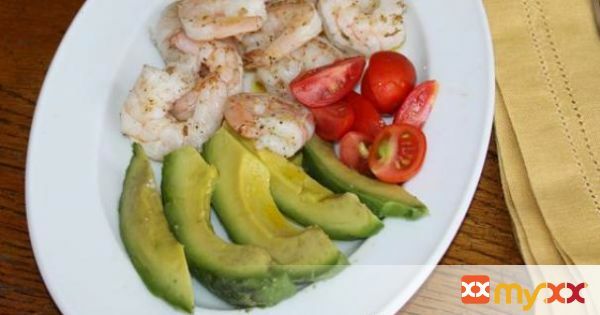 Place in a large plate the avocado slices, the cherry tomatoes and the shrimps. 7. Drizzle a generous amount of olive oil and lemon juice over the whole dish. Sprinkle with salt and pepper and serve immediately.